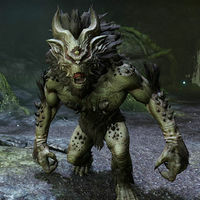 Graveltooth is a troll, and one of two bosses which can spawn in Newt Cave. Graveltooth has a chance of dropping Gravel Tooth's Tooth of Cyrodiil's Ward. You'll need to defeat it and Rock Wing to get the related achievement, but only one will spawn at any given time. This page was last modified on 9 September 2018, at 21:57.